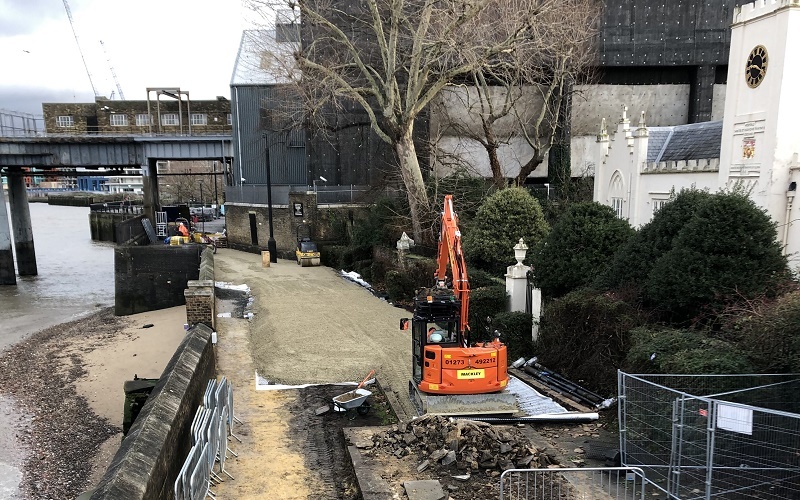 Working as subcontractor to Balfour Beatty and on behalf of the Environment Agency, Mackley is carrying out remedial works on a flood wall which protects key assets along the river Thames in Greenwich – including Trinity Hospital and Greenwich Power Station. The Trinity Hospital Flood Defence project is one of several being carried out as part of the Environment Agency’s Thames Estuary Asset Management 2100 programme (TEAM2100). The award-winning TEAM2100 programme is a top 40 government infrastructure project responsible for the refurbishment, replacement and upgrade of London’s tidal defences. Protecting 1.3 million people and £275 billion worth of property, London’s tidal defences provide a significantly positive impact to London, both in terms of its economy and to Londoners. It is the first flood risk programme to receive ISO55001 certification and is a path finder programme assisting the wider Environment Agency to try new ways of working. The integrated co-located team, is composed of three organisations with staff members from over 60 nationalities and over the last 4 years, have worked over 1.3 million hours with zero incidents. TEAM2100’s innovative approach to asset management has delivered a range of benefits including approximately £20 million in efficiencies and is on track to deliver the £100 million in efficiencies predicted at the start of the programme. At 62 metres long and 4.5 metres high, the Trinity Hospital masonry tidal flood defence retaining wall is located along the right bank of the Thames, in the East Greenwich Conservation Area. The flood defence provides an integral part of the Greenwich flood defence system, reducing the risk of flooding to the wider area. 210 Flood Defense Bags (approx. 400t of sand) will be used to strengthen the wall during the piling works. For the duration of the works, Mackley will install a root protection system for the in situ tree; and wall propping, involving six props, for the Grade II listed Trinity Hospital wall. 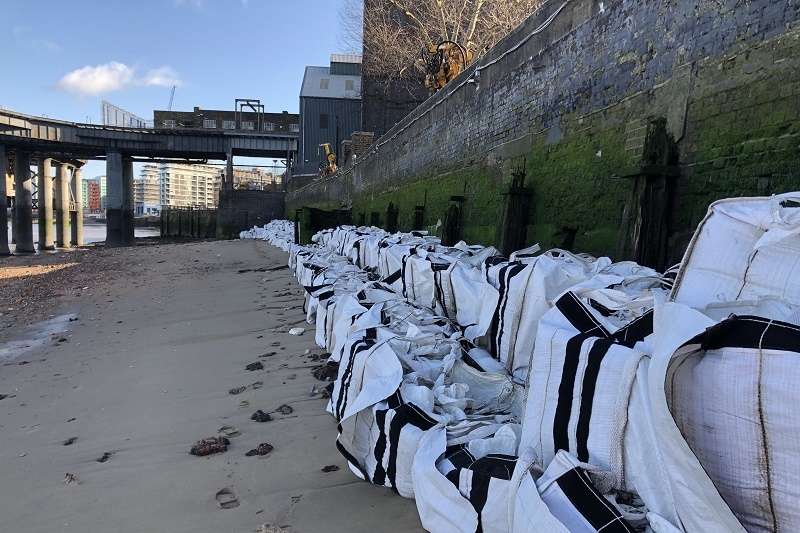 Two tonnes of sandbags will also be placed on the foreshore to protect the wall during piling. In 2018, Mackley completed the Coldharbour Flood Wall Remediation and Foreshore Protection Works on the Isle of Dogs, also working as part of TEAM2100. Balfour Beatty is a multinational infrastructure group with capabilities in construction services, support services and infrastructure investments.